They were stricken, desperate and no one could save them. We had never before seen such desperation on our TV screens. But that’s enough about Led Zeppelin’s performance at Live Aid, let’s talk about the day itself. It was the day that a scruffy, sweary Irishman entered our homes and demanded money, something that many households had only previously encountered after an offer of having their driveways tarmac’d. It was, of course, a miracle. The whole thing was organised using – get this – a couple of telephones. And not the ones that can hail a taxi to whichever godforsaken part of East London you happen to have got lost in within five minutes whilst you order a pizza for when you get home. I mean the ones that plug into a wall and have curly wires connecting two bits together – yes there used to be two parts to a phone – there was a bit where you talk and a box where there’s a circle of numbers, ah, it’s too complicated to explain. Ask your Grandad. Or Google it on your six hundred quid iPhone. Calling America used to cost five quid a minute. And that was when five quid was worth five quid, and oh dear I’ve turned into my father. Anyway, it was a miracle, to get all the world’s most talented pop stars of the day, plus Paul Young, but not Michael Jackson, to appear on both sides of the Atlantic and perform, and for the whole thing to be broadcast live only 33 years after the Queen’s coronation – which, let’s face it was when most people in the UK even saw a telly, and just eighteen years after colour TV was first broadcast. Less than two decades, from colour TV being a thing, and we’re in the UK watching pop concerts live from Philadelphia, which let’s not forget, before 1985, was only cheese. 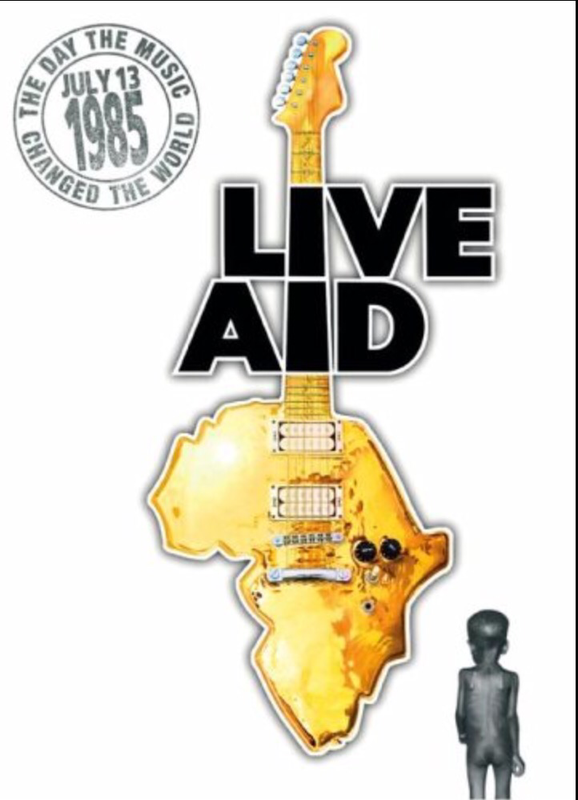 I taped some of Live Aid. I don’t mean on videotape. I didn’t have a VHS recorder. TiVo and Sky+ were still just sketches in Leonardo Da Vinci’s notebook. No. I held a tape recorder’s microphone against the speaker of my TV and prayed that my parents wouldn’t come into the room and ask “What’s all this rubbish?”. They didn’t. There was a teacher at our school who did own a VHS and who took in the tape to school the week after. We watched Status Quo, Queen and U2, whom everyone agreed had “won”. I wasn’t so sure about U2, as it seemed to me that their singer was being praised for dancing with a girl from the crowd, which seemed a bit underwhelming. It turned out later he’d saved her from being crushed by the crowd, but it didn’t spare us from having to listen to that “Bad” song for over ten minutes. Status Quo nearly won, because they started “Rockin’ All Over The World”, but were trumped by Queen, who won because a) their roadies turned the sound up in the stadium and b) they had the winners song, “We Are The Champions”, since played out at every sporting event you can think of. It’s a good move when you think about it. Beck certainly screwed up with his “Loser” song, which will never get played at sporting events, except perhaps for the odd Southend United game next season. Not everything was wonderful. Duran Duran suffered when Simon The Good regrettably yelped like a dog being put down by a satanist during “A View To A Kill”, and Adam Ant tried the equally evil trick of trying to play a new song, the memorable “Vive Le Rock”. No, me neither. Always an own goal that one. I think the decline of Scissor Sisters can be traced back to their attempt to do the same at Live 8. Not everything went to plan from a technological point of view either. The UK TV feed from Philadelphia was plagued by an intermittent but regular buzzing on the sound during Bryan Adams’ turn on stage, but it was not enough to drown him out. On the plus side, both the audio and video feed failed entirely during Simple Minds’s performance. It was thirty years ago, but I remember the day so well, and now I feel old, dammit. And whilst there are plenty of critics of the day, there’s only one thing that really matters. No, not Geldof dropping the F-bomb on live TV, although that was pretty great, or Madonna swearing, or Jagger ripping off Tina Turner’s dress, or even Smith and Jones dressing as policemen to introduce Queen. It’s this: The organisers hoped to raise a million pounds. In the end, they raised a hundred and fifty million pounds. And that was when a hundred and fif….ah, I just turned into my dad again…. Doesn’t seem possible it was 30 years ago, wish I’d been a bit older to go to the gig itself! Everyone says Queen stole the show, and they probably did. At the time, Queen were at a low ebb, one of the many dinosaurs eclipsed by New Wave and Thomas Dolby (who at the time said that in the future his music would be popular, although one could always go to a small club and see an aging geezer with a shiny guitar banging out some riffs; Dolby ended up writing ring tones for Nokia, but I don’t think that that was what he had in mind). They really rose to the occasion. Despite being an astronomer, I’m not a Queen fan, though I have always admired Freddie Mercury as a front man. I don’t think the performances were memorable, at least not in a positive sense. Phil Collins (admittedly jet-lagged from travelling by Concorde from London to New York so that he could appear at both gigs) chose the “best” moment to hit some wrong notes on “In the air tonight”. I do remember thinking that the guitarist with Bryan Ferry sounded interesting. When the camera swung to him, it revealed David Gilmour. I watched this with a friend whose father had a really expensive hi-fi system. I remember Neil Young strumming his acoustic guitar saying “Can you hear this?” and it sounded just as if he had actually been there in the living room. Lucky you. I had a black and white TV and the whole thing was broadcast in mono. Boo to your Simple Minds comment, even if Jim’s flappy slacks were really bad. Yes, sorry about that – one of those occasions when I couldn’t resist an obvious punch line. Apologies to all Simple Minds fans out there. They’re wonderful really. I remember it as if it was yesterday! I watched the Quo start it, went to a pool party in the middle where we had Top Deck (we were only 16), and finished the evening drinking Schnapps watching Black Sabbath at the house of a friend of a friend, before the static set in: no 24 hour television channels in 1985! It has been 30 years! Christ I feel old! My biggest moments will be Ozzy forgetting entire lines of songs when Sabbath was on and Judas Priest all clad in leather in 90 degree (farenheit) heat. Remember it like it was yesterday! I could watch Queen’s performance continues to amaze me today.. stellar and I was never a Queen fan. I did tape the entire concert that day in 1985 on my fairly new VHS recorder, filling three tapes. I received MTV in stereo via TV cable, with my stereo connected to the cable box, so the sound was quite good. I was glad to still have those old tapes when the DVD finally came out 7 or 8 years ago and several performances were missing. Also blessedly missing were all the celebrity commercials pleading for donations (Sally Field comes to mind) and the inane chatter of the MTV VJs. The satellite feed cut out right in the middle of The Who’s performance, which was distressing, but the DVD restored that. And Bob Geldof’s joy as he performed with the Boomtown Rats that day was unforgettable.